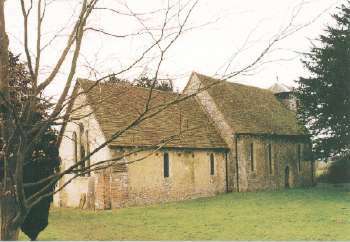 St Michael's dates from the 13th century. 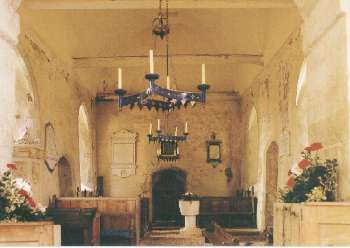 The church of flint and limestone with a weather boarded bell chamber is only a simple plastered double chamber with no aisles or transepts. With plain lancet windows throughout, white-washed walls and a bare red brick floor, at first glance it has a rather neglected appearance. Only three years ago traces of a medieval wall painting of St Christopher and the Christ child were discovered on the North Wall as well as three circular paintings in the chancel. The chancel itself, approached through an attractive double pointed arch is very plain, but its clear East window projects a fine sense of lightness. Two rather ramshackle box pews are found there where one would expect to find choir stalls.